McBride, Tom: The mechanisms of project management of software development; in: Journal of Systems and Software, Article in Press. McBride covers two aspects of tools and techniques for the management of software developments. Firstly the monitoring, secondly the control and thirdly the coordination mechanisms used in software development. 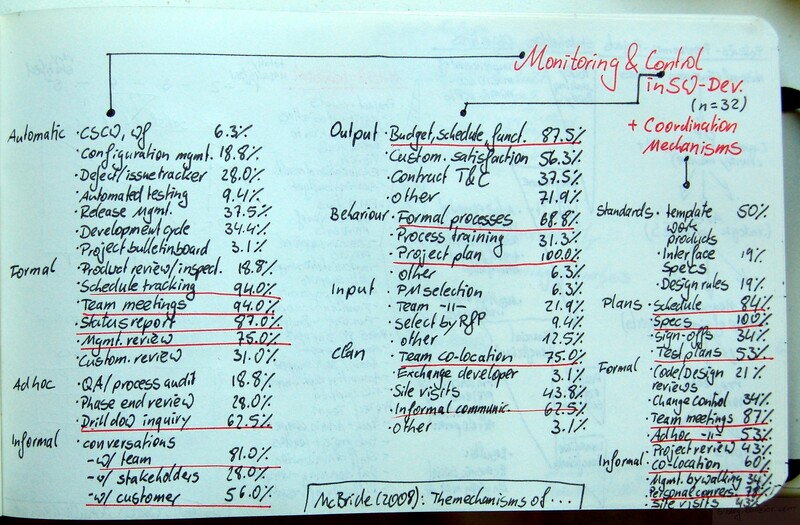 The author distinguishes four categories of monitoring tools: automatic, formal, ad hoc, and informal. The most common tools used are schedule tracking, team meeting, status report, management reviews, drill downs, conversations with the team and the customers. The control mechanisms are categorised by their organisational form of control as either output, behaviour, input, or clan control. The most often used control mechanisms are Budget/schedule/functionality control, formal processes, project plan, team co-location, and informal communities. Lastly the Coordination mechanisms are grouped by which way the try to coordinate the teams: standards, plans, formal and informal coordination mechanisms. The most common are specifications, schedule, test plans, team meetings, ad hoc meetings, co-location, and personal conversations. This entry was posted on Montag, September 22nd, 2008 at 07:58 and is filed under IT Project, Methodology, Software Development. You can follow any responses to this entry through the RSS 2.0 feed. You can leave a response, or trackback from your own site.